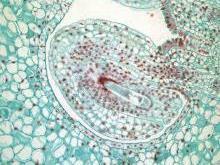 Electron Microscopy Sciences is proud to offer a complete line of Digital Microscopy Cameras. We offer a wide range of cameras based on high performance sensors, providing a variety of unique capabilities to satisfy all of your imaging applications. For more information please call or contact us today. The INFINITY1 CMOS USB 2.0 digital cameras are designed to be a cost-effective, versatile solution for clinical, life science, materials science and educational professionals. The camera is available with 1.3 to 5 megapixel resolution. Features include auto white balance, full exposure control, programmable gain, sub-windowing and region of interest. It is an excellent fit for documentation and archiving applications. The INFINITY1-2C features a unique color sensor with 1600x1200 resolution and on-board processing. This camera delivers outstanding image quality and excellent value. For complete details on the INFINITY1 CMOS Cameras, please click the links below. Equipped with a high-quality, Sony CCD sensor, INFINITY CCD USB 2.0 cameras offer excellent sensitivity, high dynamic range and a 12-bit digital output. Features include binning, auto white balance, full exposure control, programmable gain, sub-windowing and region of interest. It is ideal for higher-end scientific, medical, ophthalmic and life science applications. For complete details on the INFINITY2 CCD Cameras, please click the links below. For low light fluorescence applications, the INFINITY cooled CCD USB 2.0 cameras offer cooling to 25°C below ambient. The Sony ICX285 EXview HAD sensor has very a high dynamic range, excellent sensitivity and a 12-bit digital output. Features include binning, auto white balance, full exposure control, programmable gain, sub-windowing and region of interest. 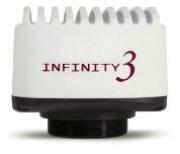 For complete details on the INFINITY3-1 CCD Cameras, please click the links below. The INFINITY3-3UR uncooled scientific digital camera features a Sony ICX674 CCD sensor, offers 53 fps at full 2.8 megapixel resolution via a high-speed USB 3.0 interface. Designed for use in scientific and industrial applications requiring optimal color reproduction, extreme sensitivity, increased resolution and high speed. Cooled performance from an uncooled camera. The INFINITY3-3UR provides unmatched light sensitivity needed for low light applications. Relying on Sony's EXview HAD ll technology, this camera offers extremely high dynamic range, 4.54x4.54 µm pixels and very low noise. The INFINITY3-3UR delivers outstanding image quality and value for challenging low light applications such as fluorescence and NIR imaging. The INFINITY3-3UR uses the latest USB 3.0 technology at 5 Gbits/sec to deliver the fastest image transfer – even at its highest resolution. Image captures can be synchronized using either a hardware or software trigger. 128 MB of onboard memory for frame buffering ensures dependable and reliable image delivery at full frame rate and highest resolution even in the most demanding systems. INFINITY CAPTURE, an intuitive image capture program, and INFINITY ANALYZE, a full image analysis package offering camera control, measurement, annotation, tiling and post capture enhancement, are included with the camera. 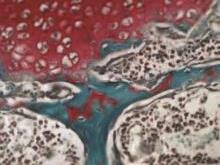 Camera and software combine to create a complete microscopy imaging solution for your application. For complete details on the INFINITY3-3UR CCD Cameras, please click the link below. To maximize the sensitivity of the new INFINITY3-6UR, a new larger 1" format Sony ICX694 sensor was used. With an approximately 50% larger active surface area than the ICX285 with 2/3" optical format, this high resolution camera achieves a more-than-4x increase in resolution with a less-than-2x decrease in effective sensitivity. The INFINITY3-6UR is the ideal general purpose camera for most microscopy applications due to its 6 MP resolution, excellent color reproduction, speed and light sensitivity needed for low-light applications. Built on Sony's EXview HAD II sensor technology, this camera offers extremely high dynamic range, 4.54 x 4.54 µm pixels and very low noise. With 2 x 2 binning, there is a fourfold increase in sensitivity while providing a 1.5 MP (1376 x 1096) resolution. The INFINITY3-6UR delivers outstanding image quality and value for challenging low light applications such as fluorescence including the NIR region. The INFINITY3-6UR uses the latest USB 3.0 technology at 5 Gbits/sec to deliver the fastest image transfer – even at its highest resolution. Image captures can be synchronized using either a hardware or software trigger. 128 MB of onboard memory for frame buffering ensures dependable and reliable image delivery at full frame rate and highest resolution even in the most demanding systems. USB 3.0 is the ideal choice for microscopy as it is readily available on today's computers, while plug-and-play connectivity makes for easy installation. TheINFINITY3-6UR comes with the fully-featured INFINITY ANALYZE, an image capture and analysis software package offering camera control, measurement, annotation, tiling and post capture enhancement. 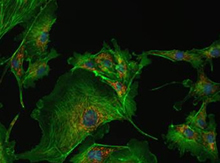 Camera and software combine to create a complete microscopy imaging solution for your application. For complete details on the INFINITY3-6UR CCD Camera, please click the link below. The INFINITY3S-1UR is a high-speed, ultra-sensitive research grade microscopy camera with 1.4 megapixel resolution. The camera incorporates Sony's new ICX825 CCD sensor, producing much higher dynamic range and sensitivity over the popular ICX285 sensor. The INFINITY3S-1UR has the unmatched light sensitivity needed for challenging low light applications, such as fluorescence and NIR imaging. Lumenera's high-speed USB 3.0 data interface provides maximum allowable throughput where full resolution images can be sent to a host computer at an industry leading 60 fps. For complete details on the INFINITY3S-1UR Cameras, please click the link below. The INFINITY4-11 camera series offers large format megapixel Kodak sensors for a wide field of view. The perfect choice for demanding high resolution imaging requiring excellent color rendition. Features include a 12-bit digital output, binning, progressive scan electronic shutter, full exposure control, auto white balance, programmable gain, sub-windowing and region of interest – ideal for high end ophthalmic, medical, clinical and life science applications. 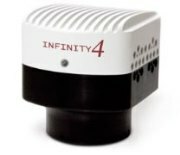 For complete details on the INFINITY4-11 CCD Cameras, please click the link below. Using patented pixel shifting technology, each CCD pixel captures full chromatic information resulting in increased color resolution with no degradation. The INFINITYX-32 is the first pixel shifting camera to utilize the highly sensitive SONY ICS274 sensor. Available at a fraction of the cost of competitive cameras, this complete imaging solution is an affordable, extraordinary tool for professionals in clinical, life and material sciences where megapixel resolution, color accuracy and light sensivity are essential. For complete details on the INFINITYX-32 CMOS Cameras, please click the link below. The INFINITYHD high definition CMOS color microscopy camera is a full featured, standalone, high definition scientific imaging solution offering full 1080p60 preview with superb color reproduction and extremely fast frame rates streaming direct to monitor. Operate the camera by directly connecting to a monitor without connecting to a PC, or utilize the plug-and-play USB 2.0 image capture. With extremely fast response times, the INFINITYHD quickly reacts to lighting changes in any life science, clinical or material application. Video output over HDMI connector to either a DVI or HDMI monitor. Three on-camera buttons allow easy access to power, white balance and image capture. Years of experience in the microscopy market have allowed the development of specialized color algorithms ensuring excellent color reproduction. 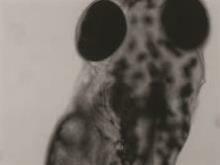 This results in a sample preview on a monitor that closely matches the view on the microscope eyepiece. For complete details on the INFINITYHD 1080p60 HD Cameras, please click the link below. 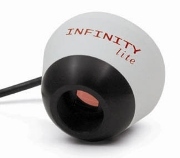 The INFINITYlite is specifically designed for the educational market as well as entry level microscopy applications. It is a compact, affordable microscopy camera that delivers outstanding image quality and excellent value. Highlights include live video preview and focus for the efficient capture of optimal images, as well as full integration to popular third-party imaging applications through our TWAIN drivers. All INFINITY cameras include INFINITY ANALYZE Software at no extra charge, allowing complete camera control and advanced image acquisition and analysis. Also included is INFINITY CAPTURE, an intuitive user interface that contains all of the basic features needed to control the camera and capture images. Easily integrate your INFINITY camera with 3rd party software applications through our TWAIN and DirectX/WDM interface (included) as well as 3rd party drivers for most image analysis packages. An Advanced Features Model is available as an accessory to perform depth of focus and spherical aberration correction.